(woodhoopoes) (Mayr 1998b; Mayr et al. 2003; Ericson et al. 2006; Livezey and Zusi 2007; Brown et al. 2008). 1998b, 2000h, 2006a). These fossils belong to the Messelirrisoridae, whose three named species, Messelirrisor halcyrostris Mayr, 1998, M. parvus Mayr, 1998, and M. grandis Mayr, 2000, mainly differ in size. 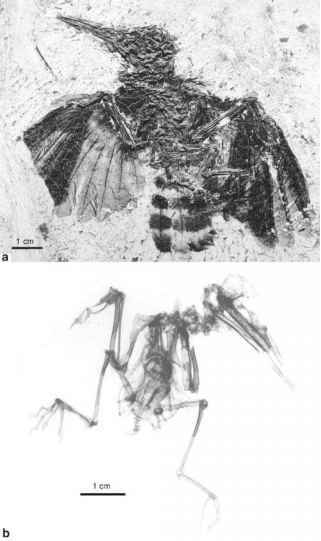 Together with the Zygodactylidae, messelirrisorids are the most abundant small birds in Messel, and their fossil record consists of a fair number of well-preserved skeletons. Fig. 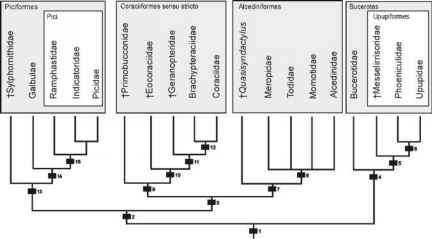 16.13 Hypothesis on the phylogenetic relationships between Paleogene and extant representatives of the "Coraciiformes" (part) and Piciformes. Selected apomorphies of the nodes: 1 mandible of hatchling projecting beyond upper beak, greater ventral coverts of secondaries reduced; 2 acromion of scapula distinctly bifurcate (except Galbulae); 3 upper beak of nestling hooked; 4 mandibular symphysis rectangular, sternal manubrium with spina interna, femur with pneumatic foramen on craniolateral surface (except Messelirrisoridae); 5 mandible with large ret-roarticular processes, proximal end of ulna with projection on dorsal surface distal of dorsal cotyla, carpometacarpus with distinct ridge from caudal end of minor metacarpal to pisiform process; 6 sternal extremity of coracoid with marked medial projection; 7 proximal end of proximal phalanx of hindtoe with lateral projection, feet syndactyl; 8 sternal extremity of furcula very narrow; 9 minor metacarpal with ventrally protruding projection on ventral side of proximal end, distal inter-osseous canal (canalis interosseus distalis) of tarsometatarsus plantarly open; 10 postorbital process strongly elongated; 11 postorbital process with cranial projection, carpometacarpus with intermetacarpal process; 12 small foramen on ventral side of proximal part of minor metacarpal; 13 proximal phalanx of major wing digit with proximally protruding process (unknown for Sylphornithidae), humerus with far ventrodistally extending, large fossa for brachialis muscle which is situated on the far medial side of the bone and has a weakly developed ventral margin, carpometacarpus with well-developed intermetacarpal process which is fused with minor metacar-pal, trochlea for fourth toe with plantarly projecting wing-like flange; 14 tarsometatarsal trochlea of fourth toe with well-developed accessory trochlea; 15 tarsometatarsus with large, distally elongated accessory trochlea and very small trochlea for second toe. (After Manegold 2005; Mayr 2004g, 2006a, 2008b; Mayr and Mourer-Chauvire 2000; Mayr et al. 2003). A sister group relationship between the Messelirrisoridae and crown group Upupiformes (Fig. 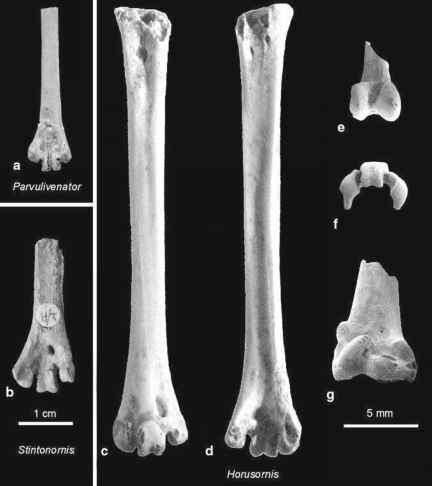 16.13) is supported by a number of derived characters, including the presence of large, blade-like retroarticular processes on the mandible, a characteristic tubercle on the proximal shaft of the ulna, distal of the dorsal cotyla, and a distinct ridge from the caudal end of the minor metacarpal to the pisiform process (Mayr 1998b, 2006a). Messelirrisorids lack several derived characters shared by extant Bucerotes (Mayr 2006a), but their original identification as stem group representatives of the Upupiformes is supported by a phylogenetic analysis based on a comprehensive data set (Mayr 2006a). An as yet undescribed skeleton from the Green River Formation, which was figured by Grande (1980, Fig. III.19) and Feduccia (1999, p. 335), also seems to be a member of the Bucerotes, as indicated by the very long hallux and the derived morphology of the carpometacarpus and distal tarsometatarsus. This specimen would constitute the first New World record of the taxon. Mayr (1998b) noted that Laurillardia longirostris Milne-Edwards, 1871 and L. munieri Flot, 1891 from the late Eocene of the Paris Gypsum are stem group representatives of the Upupiformes. These species were before regarded as passeri-form birds and assigned to the new taxon Laurillardiidae by Harrison (1979a). Small upupiform species were also found in the early Oligocene of the Luberon; these fossils are in private collections (own observation).